Evenly distribute mixed greens onto chilled salad plates (1 c. each plate). Top greens with cheddar cheese, apples, red onions, cranberries and walnuts. Measure extra virgin olive oil into a small bowl. Slowly add the balsamic vinegar, whisking continuously. Add salt and pepper to taste and whisk until emulsified. Drizzle each plate with vinaigrette and serve immediately. 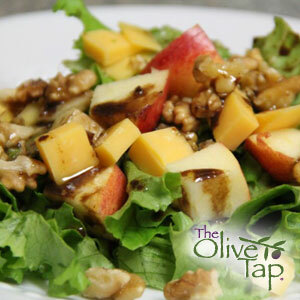 For this recipe we used a 1 to 1 ratio of oil to vinegar, creating a sweeter vinaigrette. If you would like to reduce the sweetness, alter your ratios to 2 or 3 parts oil to 1 part vinegar.